When the Durand-Ruel gallery bought this painting in 1908, Georges d'Espagnat's reputation was already well established. He had often exhibited at the Salon des Indépendants and he was also a regular at the new Salon d'Automne. From 1897 he had a contract with the Durand-Ruel gallery, which exhibited and regularly bought his works. The artist admired Delacroix and Rubens, as well as the great Venetians, Titian and Tintoretto. He was also fond of the Impressionist painters, and particularly of Renoir, whom he visited in Cagnes in the company of his friend Valtat. Clearly, Georges d'Espagnat was sensitive to colour, but as was indicated in the article he published in 1905 in the Mercure de France, a true plea in favour of a return to composition in painting, he noted with regret that the production of his times had "few paintings, and many sketches." In his opinion, the artist was meant to gather indications taken from nature, before "coordinating them, bringing out the essential characteristics, and creating a definitive, complete, solidly constructed and logically deducted work, " and he added: "one can only think properly in the silence of the studio." He concluded with a tribute to Delacroix, and ended his article with the famous quote: "Nature is but a dictionary. In order to understand the full meaning of this sentence, one must think about the many different common uses of a dictionary. One can look up the meaning of a word, the generation of words, the etymology of words, and one can extract all the elements which compose a sentence or a text, but nobody has ever considered a dictionary as a composition, in the poetic sense of the word." Thus, the artist shared the essential preoccupation of the post-Impressionist generation which, from Cézanne to the Nabis, not to mention Seurat and Gauguin, proclaimed the need for a return to the composed work. And, in fact, Georges d'Espagnat does not "copy" here a piece of nature passionately observed in the impressionist style, for the simple reason that this composition takes up very faithfully an ink drawing, an imaginative piece destined to illustrate a collection of poems by Rémy de Gourmont, Simone, published in 1901. Georges d'Espagnat's drawing appeared in the luxury reissue of this collection, published in 1907 by the Librairie du Mercure de France.It illustrated a poem entitled Le Houx (The Holly) and clearly draws inspiration from the lines: "Simone, le soleil rit sur les feuilles de houx / Avril est revenu pour jouer avec nous. / Il porte des corbeilles de fleurs sur ses épaules" "Simone, the sun smiles on the holly leaves / April has come back to play with us./ It carries flower baskets on its shoulders." At the same time as he made the drawing, or shortly afterwards, the artist painted this work which was mentioned in his notebooks under the title Simone, a painting in the 25 Figure size indicated under the section "1908, February, to Durand", which confirms the date of the sale to the famous dealer. 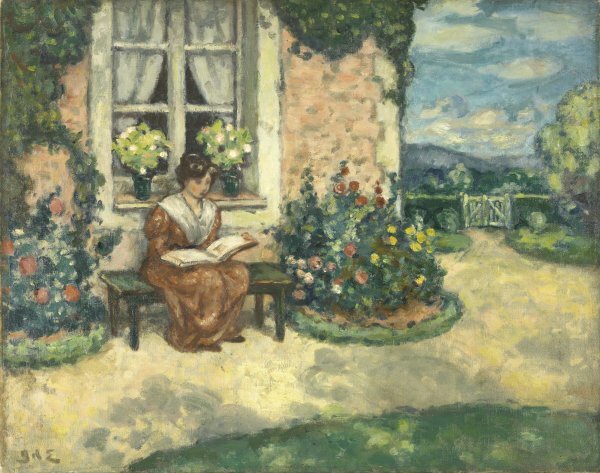 Thus, apart from the clear thematic relationship with Impressionist painting implied by the choice of a scene from everyday life out of doors-it brings to mind, for example, Monet's Women in the Garden-d'Espagnat is not concerned with fixing on the canvas a fleeting instant. And in spite of an attentive analysis of the light shown in the clear sky crossed by light clouds which project shadows in the foreground, the painter presents us with a carefully designed composition. Parallel to the surface of the painting, the plans are regularly developed as far as the hills in the horizon, the flower beds and flower pots placed on the window sill are organised symmetrically; the warm and cold colours are balanced, as well as the horizontal and vertical lines, softened by the curves of the green masses and of the young woman's body. The serene figure of the woman reading is treated in the same shades of ochre and pink as the bricks and the flowers. The simplified forms are synthetic and clearly defined. A deep feeling of harmony impregnates this work, which is a coloured echo of Rémy de Gourmond's poem.